(Sega Channel) 1995-06 ¥? ? 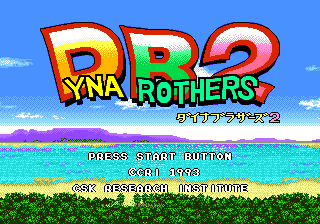 Dyna Brothers 2 (ダイナブラザーズ２) is the sequel to Dyna Brothers, and is a Sega Mega Drive simulation game released exclusively in Japan. It plays very much like the first game in the series, but adds a variety of new content such as different modes and the addition of a pterodactyl character named Putera (プテラ). CRI also released an expanded version on the Japanese Sega Channel, Dyna Brothers 2: Sega Channel Special (ダイナブラザーズ２スペシャル). This version has since been rereleased on the Japanese Virtual Console, from which the ROM comes from. Whether or not there was a North American release as such is unknown. Renshuu Mode -- Tutorial mode. Player is taken through different scenarios and asked to complete certain tasks for each stage. Basic gameplay concepts are taught as a result. Story Mode -- Follows the game's main narrative with specific goals. Original Mode -- Regular mode with no cut-scenes or specific goals. Player must win using general victory tactics as in the first Dyna Brothers. Taiketsu Mode -- Two-player battle. Using commands is done as in single-player mode, but with a limited amount of time to choose between each turn. View switches between each player's screen as turns are taken. Main article: Dyna Brothers 2/Magazine articles.